Among all the doctrines of the Bible there is none that occupies a more critical position than that of the inspiration of Holy Writ. We commonly refer to the doctrine of Justification by Faith Alone as the central doctrine of the Christian religion, the articulus stantis et cadentis ecclesiae. But even this fundamental truth of personal faith is not a matter of subjective certainty. It depends, rather, as do all other articles of faith, on the objective certainty of the Word of God, as a whole and in all its parts. In this respect the doctrine of the inspiration of the Bible is fundamental for the entire corpus doctrinae. If Christians in general, and particularly Christian theologians, preachers, and teachers, cannot be sure of the matters which they present in their teaching, then the Bible will cease to be the one norm of doctrine and rule life, and Christianity will cease to be the one absolute religion. These considerations are so pertinent because, to all appearances, the systematic efforts to discredit, and rule out, the doctrine of inspiration which were made in Germany and elsewhere during the latter half of the last century [19th Century] have been gaining in boldness and strength during the past two decades, until practically every denomination is infested with men who either deny the truth of inspiration altogether or teach a form of inspiration which is so modified as no longer to resemble the clear truth which for centuries had been both foundation and bulwark of the Church. 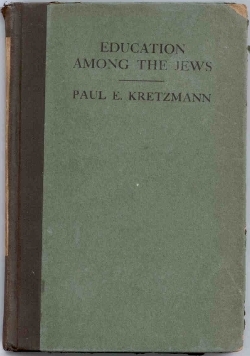 Kretzmann, P. (1936). 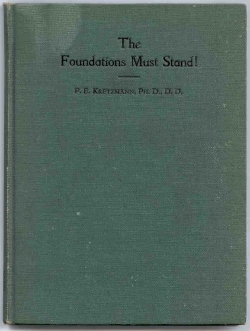 The Foundations Must Stand! The Inspiration of the Bible and Related Questions St. Louis, MO: Concordia Publishing House. pp. 3-4. As we all know, despite this work of Dr. Kretzmann's, challenges to the doctrines of inspiration and inerrancy continued to grow in the LCMS, until by the 1960's the situation reached crisis proportions. The Crisis of the Word was the theme of that decade and into the one following, from which, to God's glory, the LCMS emerged affirming a fully orthodox position on the questions of inspiration and inerrancy, and rejecting the errors of the critics. In the meantime, however, Dr. Kretzman and others could not abide the error wrought by deniers of inerrancy, particularly the error of unionism. In 1951, Dr. P. E. Kretzmann left the LCMS along with sixteen other clergymen and laymen, forming the Orthodox Lutheran Conference (OLC). A brief, early history of the OLC, written by Dr. Kretzman, can be read here: A Short History of the Orthodox Lutheran Conference. Although just a small collection of men, this group supplied such pressure on the LCMS, that the objections of the WELS and ELS over the same issues could not be ignored. In fact, the OLC was credited by their contemporaries in the LCMS with forcing that Synod to take the doctrinal concerns of WELS and ELS seriously. As all to often happens, unfortunately, division within this small group developed within a short period of time. Charges of unionism were levied against Dr. Kretzmann by some of the OLC members, leading, in 1956, to the separation of Dr. Kretzmann, and four others who supported him, from the Conference. Later, after the withdrawal of WELS and ELS from the Synodical Conference over the persistent errors of the LCMS, Dr. Kretzmann and his supporters joined the WELS. A more thorough history of the OLC, which includes many of these details, can be read here: A Popular History of the Concordia Lutheran Conference (through 1980). In publishing this little booklet, the author is very well aware that he is placing himself in the most unfavorable light and courting the most adverse and abject criticism of so-called scientific scholarship of the Bible. But he freely acknowledges and proudly confesses his absolute rejection of all scientific criticism of the Bible outside of textual research and stands squarely for the infallibility of Holy Scriptures. The Christ Whose words even the most rabid critics admit to be historically true: "The scripture cannot be broken," Jn. 10:35, "Till heaven and earth pass one jot or one tittle shall in no wise pass from the law, till all be fulfilled," Mt. 5:18, was either what He claimed to be, the eternal Son of God, Who gladly permitted the attribute of Omniscience to be ascribed to Him, and Who in these words is a frank exponent of the infallibility of Holy Scriptures, or He was the most despicable hypocrite and cheat the world has ever known. And I confess that I believe it far better to stand with Him foursquare against all criticism of His eternal word, which is the revelation of His divine Essence, than to stand on the uncertain ground of modern Biblical criticism and degenerate into a vapid spouter of moral platitudes. Much better by far to accept the inspired Scriptural account of the creation of the world and of the history of the Jewish people word for word which has stood the test of the ages and endured the vain mutterings of foolish criticism both here and abroad than to accept the inane theory of a so-called cosmic evolution. Which is the more reasonable and more conformable with common sense: the plain, unadorned Scriptural account that bears on its face the stamp of veracity, or the bolstered-up bombast of the forfenders of evolutionistic doctrines? The author's stand will not be misconstrued by people that have made a study of both sides of the question. In any question pertaining to this world's wisdom I believe in research and criticism to the full extent, but far be it from me to profane the Holy Book of God with sacrilegious hands. So much for the spirit in which the author has used the Bible as source material. 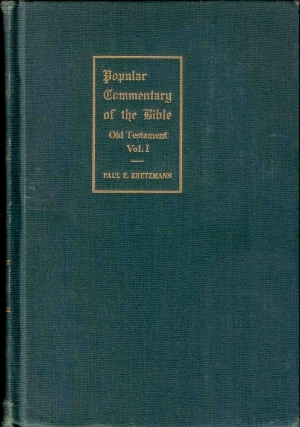 Kretzmann, P. (1915). Education Among the Jews: From the earliest times to the end of the Talmudic Period, 500 A.D. Boston: The Talmud Society Publishers. pp. 5-6. This is the voice of conviction – is it not? 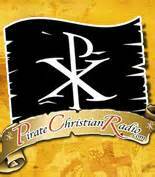 – the sound that a Christian makes as he lives by conscience while facing the enemies of the pure Gospel of Jesus Christ. Dear reader, is this the sound you make when the World attacks the Scriptures and would rob you of the peace and assurance you have in the promises of Christ? Is this the sound you are encouraged to make? Or are you told that it is "more winsome" to prevaricate, "more evangelical" to equivocate, "more loving" to just grin and bear it? I would like to respectfully request that you correct some information in your third paragraph above. You apparently relied upon the Concordia Lutheran Conference's account of the early split within the OLC, and that results in some misinformation. It is more accurate to say that it was the founders of the ConcLC who were separated from the OLC, which is why they were the ones who adopted a new name and why the greater part of the OLC's congregations and efforts remained with the Kretzmann/McLaughlin group. If you wish more information on the OLC, I have a paper I can send you by email that outlines this in a bit more detail and provides some more references. Just let me know. Thank you very much for the corrections! I should have known better than to reference that ConLC article the way I did -- I should have added some sort of disclaimer, noting its apparent one-sidedness. Frankly, I could have eliminated the entire paragraph, as it was purely transitional anyway and was meant to contain just condensed history. I knew about Kretzmann's LCR connection, although I am fairly certain that in one of their own essays I had read that he was buried WELS, but I didn't want to clutter a transitional paragraph with that much detail. If you say he was never WELS, hosever, then I'll go along with that. Like I said, I should have just eliminated that paragraph. Personally, I have been very frustrated over the years trying to find any definitive biographical information on Kretzmann at all. To me, based on his manner of writing, the topics he treated and the key times he addressed them, he is a fascinating figure. I have found his works to be both helpful and relevant, and am curious to know more about the man. Perhaps his departure from LCMS, his work with the OLC and later the LCR, rendered him persona non grata, and would make it impossible these days to write a biography that couldn't be rendered unfavorably. I don't know. But it does seem that his name has been stricken from every pillar and obelisk of the old Synodical Conference. I can't even find a picture of the man! Anyway, I think that I will leave the paragraph as is, and note your corrections. Oh, and I would be grateful for a copy of that essay on the OLC. I hadn't heard that Kretzmann was "buried WELS". Without looking it up, I could see how that might have been *possible* as I think that at that time the LCR and the WELS were still "exploring fellowship" -- so that if there were no LCR pastor/congregation nearby, his family might have turned to a local WELS pastor. But I will say that nothing in my research or conversations suggested that he ever actually joined a WELS congregation. But I cannot agree more with one of your points above: we are seriously lacking biographical information on P.E. Kretzmann. Someone really needs to write a biography -- or even just a good biographical paper -- before everyone who knew him at all passes away and his papers and such all end up on the trash heap of history. He was just too significant a man to 20th century American Lutheranism to be so poorly remembered. Any writers, scholars, or seminary students out there listening? Pastor Samelson and I shared an uncle who was personally involved in the formation of the OLC. My parents and both sets of grandparents were also part of the OLC, and PE Kretzmann attended their wedding at the OLC church in North Minneapolis. One of the stories I heard often about Dr. Kretzmann is that his commentaries reflected a great deal of the exegetical work of Georg Stoeckhardt. I was told that when I read Kretzmann, I was reading Stoeckhardt. Another story I heard often was when Dr. Kretzmann was working on his commentary he would write his manuscript out in long-hand, and he would have his source material laid out on large tables from which he would work. Apparently he was also very punctual. When someone was late to an appointment with him, he chided the person when he finally arrived saying something like, "Why are you late? Do you know what I can do with five minutes?" It's also interesting that some OLC congregations eventually ended up in the Church of the Lutheran Confession (CLC). CLC churches in Detroit Lakes/Ponsford, MN, Fridley, MN, Ballwin, Mo and Okabena, MN had OLC connections in one way or another. The OLC church building in North Minnespolis where their seminary was also conducted, under the direction of Dr. Kretzmann, no longer exists. On the site on Lyndale Ave. is an African-American Baptist Church. The church moved out to the Twin Cities suburbs in the mid-1960's, and is now a WELS congregation. I find this all very fascinating, especially in light of the fact that Dr. P. E. Kretzmann was my maternal grandfather (my mother having been his youngest child, born 11/1919). While I know quite a bit about him, and was actually privileged to 'sit at his feet, learning' as a young boy, I must admit that I do not know enough about him. I have some raw biographical information, and a couple of really good stories about him which my father (his son-in-law) shared with me and my sister, but beyond that, I wish that I had been able to get to know him better. I've made up for it, a little, by being one of the team members which electronified his 'Popular Commentary' in 2004-5, with the Lutheran Church of the Reformation, which I think he helped to found. What I AM looking for is the name of the church in the Chicago area (Oak Park/Forest Park area) where he was called to minister after he left his professorship at Concordia in Clayton. Does anyone have that information? You may reach me at my E-mail address (below).